There are multiple bands named Empty: 1. 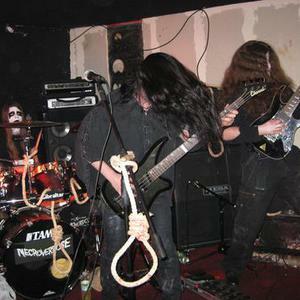 Empty - Depressive Black Metal band from Spain. Empty was formed in 1995 when Maligner and B. Sanety decided to make a band in order to satisfy their darkest musical feelings. In 1996 Kurgan was incorporated and the first songs were composed with him - the sound being relatively simple and raw. Drizzt joined the band in 1997 on bass. Later, in 1998, Kurgan was expelled from Empty, so Drizzt took charge of the arrangements of the old songs and composition of the new ones. 1. Empty - Depressive Black Metal band from Spain. Empty was formed in 1995 when Maligner and B. Sanety decided to make a band in order to satisfy their darkest musical feelings. In 1996 Kurgan was incorporated and the first songs were composed with him - the sound being relatively simple and raw. Drizzt joined the band in 1997 on bass. Later, in 1998, Kurgan was expelled from Empty, so Drizzt took charge of the arrangements of the old songs and composition of the new ones. In 1998 Vanth firstly appeared as a session guitar player, but later he became a permanent member of the band. His permanent position in the band was an important development in the evolution of Empty, both in terms of his compositional skills and technical ability. Between 1998 and 1999 the first gigs took place. Due to friends requests, a rehearsal was recorded, which was distributed to zines and radio-stations. In 1999 the band decided to continue without Sanety and decided instead to include Sergh as the new drummer, who previously had played with Thrash and Death metal bands. Between November of 1999 and May of 2000 the debut album was recorded in a semi-professional studio. The recordings still maintained the desired 'cold atmosphere' despite this. The mCD captured the attention of the underground scene and received good reviews. In the beginning of 2000 Maligner left the band and Drizzt & Vanth took charge of the vocals. That year Orgall - a second guitar player - joined Empty. In November and December Empty embarked on a mini-tour in Spain and played a gig in Madrid with Immortal and Primordial. In February a second edition was out by Atlantida rec. in B/W and with Lyrics included. In the middle of 2001 Sergh quit Empty and Damastor took his place. In late Winter of 2001, ?A source of Hollow Essence? was recorded in a professional studio. This album captured the attention of Blackened Moon from the USA and they decided to edit the album (which was eventually released in December of 2002). This record was a noticeable improvement as far as technical skill and overall atmosphere was concerned. 2. empty - electro-industrial band from Sydney, Australia. The Australian band Empty began in 2005 as a studio project by Sydney based musicians Aaron Potter and Daniel Brunet. The debut EP in 2006 carved an emotive and complex trail into the Electro-Industrial genre by combining pulsing electronics overlaid with vast, sweeping soundscapes. 2008 brought the release of a remix EP and single which highlighted elements of Glitch and marked the beginning of a new era for the band. The long awaited debut album "Surfacing" in 2010 integrates organic emotion with raw elements of desperation and melodic electronics. 3. EMPTY - Pop Ska Punk band form Japan! EMPTY formed in 2005 while still at high school. They are influenced by swing music and it shows in their own style of pop ska punk!